Matt C: Feels like a case of 'the usual suspects' this week when I look at what's on offer, with the likes of Avengers, Deadpool, Fantastic Four and New Avengers making repeat appearances, and while I hope to enjoy them all (to varying degrees - Fantastic Four is still on probation as far as I'm concerned!) I do like to pick something that I think stands out of the pack, and this week that'll be Think Tank: Fun With PTSD #1. My internal acroynm deciphering system translates that as Post Traumatic Stress Disorder, and based on my previous experience of the series I'd say that writer Matt Hawkins only has his tongue partly in his cheek with that title. I would hazard a guess that this isn't going to be much of jumping on point for a series that has consistently proven to be smart and serious with a nice helping of humour to keep things balanced. More likely it's for existing fans but perhaps the knowledge that a percentage of the proceeds is going to the Wounded Warriors Project may prompt others to give it a look and get a sense of what it's about. 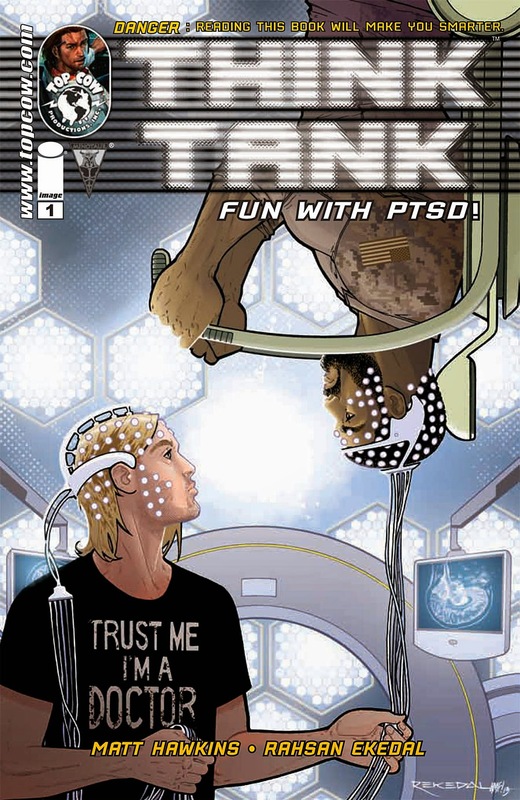 I would say that if you like the idea of an intelligent comic book that takes in the ramifications of bleeding edge military science in real-world scenarios and you're not already reading Think Tank, you're doing yourself a great disservice. Stewart R: It's a pretty darn quiet week for me with no new titles that I'm interested in picking up and only 7 books on my pull-list. It's the usual one-two combination of Avengers #29 and New Avengers #18, though I'll admit that I'm behind on my reading for both titles, only reading Avengers #28 ahead of the run to see that teased Bruce and Tony conversation/showdown. I'm really looking forward to Avengers Undercover #4 as it's evident now that Dennis Hopeless is continuing to capture that same magic that he did with Avengers Arena last year and this should be the point where the direction for this ragtag team of troubled teens will become much clearer as they become entwined with the Masters of Evil. The last Marvel book in the line up is Simon Spurrier's X-Force #5 and it'll be interesting to see if he continues to look at individual members of the squad in more detail or whether the plot gets pride of place this time. Elsewhere around the publishers I will, like Matt, be picking up Think Tank: Fun With PTSD #1 with Bounce #12 being the only other Image book in my slot. Then it's just left to FBP: Federal Bureau of Physics #10 to close the show for this Wednesday and considering that the previous nine chapters have been highly enthralling reads there's no reason to expect this week's effort to be anything less than sterling.